Is the lack of technical women a global issue? At Global Tech Women we believe the solutions to increasing the numbers of technical women must be viewed holistically and around the globe. This is not a national issue, but a global one. November 18, 2013: "A recent study from the European Commission (EC) claims that a lack of opportunities for women in tech firms is damaging the economy in the region. According to the ‘Women Active in the ICT Sector’ report from the European Commission, women are still underrepresented in IT jobs. For every 1,000 women in the EU with a degree, only 29 hold a degree in information technology, compared to 95 men. Also just 4 of those women will eventually work in the IT sector." February 7, 2014: The Education, Culture, Sports, Science and Technology Ministry conducted a survey in 2012 and found that women constitute a mere 14 percent of all researchers in Japan. By comparison, more than 30 percent of the researchers in the United States and United Kingdom are women. In Japan, women’s numbers are particularly low in the physical sciences, engineering and agriculture. December 12, 2013: A technology industry group is trying to encourage more women to work in the sector. A recent survey of information and communications technology (ICT) companies found they would be hiring thousands of staff in the coming years, but very few applications are from women. Half of respondents reported between zero and 10% of job applications are from women. 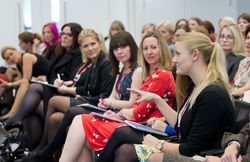 February 26, 2014: A new placement scheme has launched to boost the number of women choosing these two fields as a career. Forty-five new summer placements have been created as part of the Careerwise initiative, which aims to help create a more equal workforce.